With a stay at Comfort Inn Lebanon Valley-Ft. Indiantown Gap in Jonestown, you'll be within a 15-minute drive of Hollywood Casino and Fort Indiantown Gap National Guard Training Center. This hotel is 16.1 mi (26 km) from Hersheypark and 16.7 mi (26.9 km) from Hershey's Chocolate World. Grab a bite from the grocery/convenience store serving guests of Fairfield Inn & Suites by Marriott Lebanon Valley. A complimentary full breakfast is included. With a stay at Days Inn by Wyndham Lebanon/Fort Indiantown Gap in Jonestown, you'll be within a 15-minute drive of Hollywood Casino and Fort Indiantown Gap National Guard Training Center. 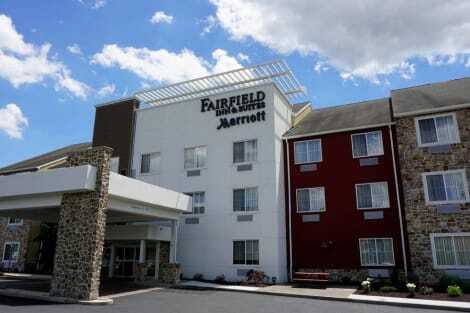 This hotel is 18.3 mi (29.4 km) from Hersheypark and 18.9 mi (30.4 km) from Hershey's Chocolate World.